Thanks to the VMUG organization, I was invited to join a dinner the night before the Boston VMUG with a whole bunch of folks just this once, including VMUG leader/powerhouse Steve Athanas. Boy does he know how to put on a show! I'm very grateful for this chance to hang out with the people that made this year-end event so very memorable. There right next to me over great eats was Emad Younis of Tintri, who I had spent some time with back at The Reckoning. He told me a bit about his recently published Deploying vCenter Server Appliance (VCSA) 6.0 U1 on Ravello. Wait, there's more! In walks VMware's worldly Brian Graf, of the VMware PowerCLI Blog, and visiting as a speaker. See also his work and many scripts at vTagion, including his recent new beginnings post. He's been so kind to me for a long time, and shared such fun travel stories and work stories. 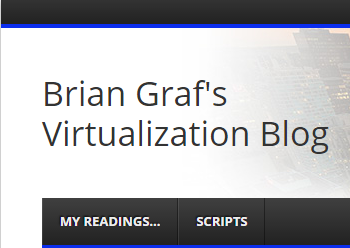 Visit vTagion, Brian Graf's Virtualization Blog. Then VMware's Rawlinson Rivera arrived, for some relaxed conversation, and total hijinx. He's a Principal Architect working in the Office of CTO for the Storage and Availability Business Unit at VMware. Dang! Wasn't I just reading his amazing vSAN articles recently, such as VMware Virtual SAN Caching Algorithms? Oh what fun to meet him, and what a storyteller. Visit Punching Clouds, a blog about Virtualization, Cloud Computing, and other cool stuff! 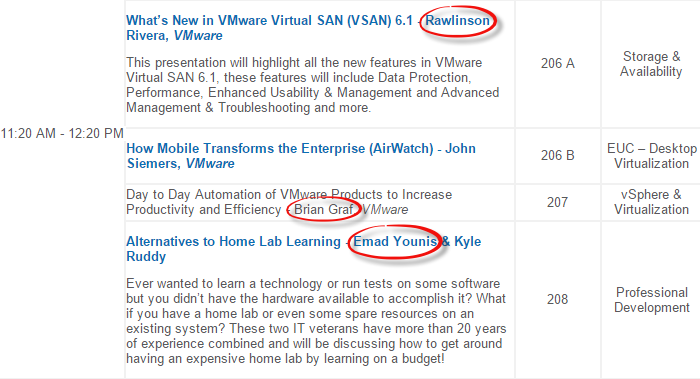 Regrettably, I couldn't possibly attend Brian and Rawlinson's sessions, as they were right up against Alternatives to Home Lab Learning - Emad Younis & Kyle Ruddy. and I somehow missed Jonathan Frappier & Sarah Zelechoski's Practical DevOps - Real World Stories About Small and Medium Size Businesses Embracing the DevOps Culture to Build More Effective Teams. Glad I got to meet Kyle Ruddy too. The gentle ribbing he gave Jonathan Frappier of VIRTXPERT sure was good fun, seen below. Jonathan Frappier getting gently roasted by Emad Younis and Kyle Ruddy. Then there was VMware's Ravi Soundararajan, who presented "vCenter Performance Best Practices" during lunch. Deep stuff! Oh, and that dinner! Yes, featured Bacon. Lots of bacon. Chocolate covered bacon, potatoes and pineapples and bacon. My what a nice way to end a fine day of learning. On stage during the eats was SolidFire's Jeramiah Dooley, see also his Virtualization for Service Providers. He absolutely killed it on stage, with all sorts of hilarity and career insights. Yes, IT careers are a bit zany and random, with no two paths alike. Good belly laughs all around. I suspect he gets a lot of speaker invites, and he's the same guy that I borrowed those lovely vExpert charts from recently. Finally, the day ended with a rather amazing 12 home server give-away. 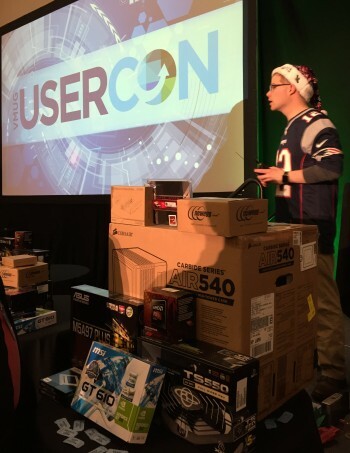 The most ever given away at any VMUG worldwide. My goodness! By the way, I always quite enjoy finding out what's new. This time, I brought along a mic, so here my informal recordings of a few of my visits.